From names and initials to fun characters and designs, metal stamping allows you to personalize jewelry, gift tags, scrapbooks, and more. This fun technique lets you emboss thin pieces of metal in a variety of different ways. No matter what metal you're stamping or the design you're imprinting, the technique for stamping metal is nearly always the same. Select the stamp or stamps you plan on using. 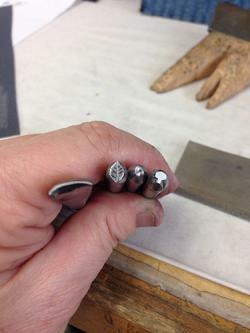 If you intend to write a word or put a set of initials on your metal, plan on practicing on a few pieces of scrap first until you get comfortable with how far apart the stamps need to be from one another. Set the sheet metal or jewelry disc you plan on stamping down on top of the bench block. Set the stamp on the sheet metal. Remember that the stamp is reversed, and that most stamps will not show the finished image on top. If the way your image is aligned with the metal is important, or you're stamping a string of words or images, take a second to check and make sure everything is lined up facing the same way. Hold the stamp straight up and down on the metal with one hand. Make sure the stamp is perfectly vertical as you hit the top firmly with the hammer. 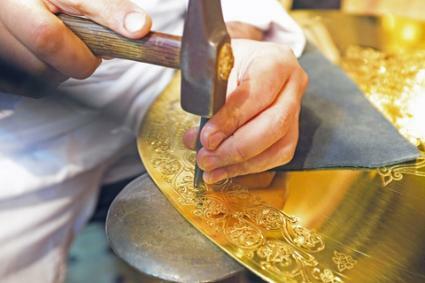 Depending upon how thick the metal you are stamping is, how big the stamp is and how hard you hit it with the hammer, you may need to hit it several times to get adequate depth with your stamp. If you remove the stamp from the metal to check its depth, slide it back into the indentation by pushing it across the metal and wiggling it slightly so the next hit will not blur the first impression. Continue hitting the stamp with the hammer until you get the impression you desire. Line up your second stamp if using multiple images and repeat until all stamps are used. Trace the interior of your stamped images with a black permanent marker. This will make the stamped image stand out better and make it easier to see. Rub a small amount of metal polish into the surface of the metal, around the impressions. This will clean up any marks left by the stamp, hammer or marker that are outside of the impressions. Gently swipe the polish over the tops of the impressions to clean up the edges and make the design more clear. Rub a sandpaper block over the metal when you are done stamping to give the finished piece a textured appearance. Run the block in one direction only for a satin look. 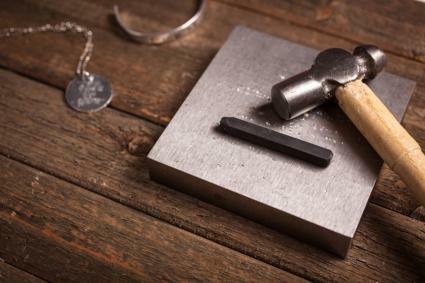 Use a metal punch at the top of a jewelry tag or disc before you stamp. Then use the hole as a guideline for lining up your stamps so they come out evenly, and you can thread a chain through the hole to create a necklace or key ring. Before cutting your sheet metal to the size you want, glue a piece of paper in the desired design onto the metal using rubber cement. Then just cut around the paper's outline with a jewelry saw. The paper will peel right off when you are done. Metal stamping is a fairly easy technique to pick up once you get a feel for how hard you need to strike the stamp. Practice on a few pieces of scrap metal before you get to your design, and you'll be creating fun and unique metal accents in no time.